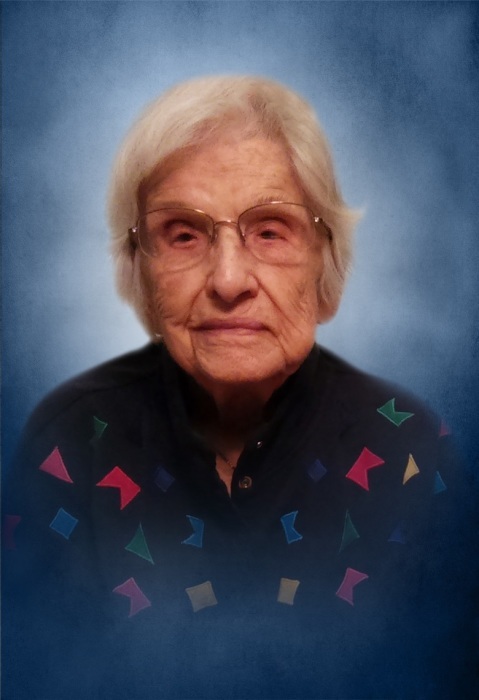 Born 29 November 1915, passed away January 29, 2019, at the age of 103. She has spent the last four years in the loving care of her daughter and son-in-law in Sleepy Hollow, IL. Mildred was born to John and Bertha Eyler near the town of Alexis, IL and spent her early years in small farming communities, and different farms around Monmouth. Mildred was one of ten children, one brother passing at age 10. All of the nine children put in their time working on the farm. Mildred attended school in Monmouth graduating in 1933. For two years of school during the depression, Mildred was a live-in caretaker for a Dr. and Mrs. McKinley in Monmouth. Her wages provided her with books and clothing, and savings enough for a trip to the World’s Fair in Chicago. In 1933 while working at the W.P.A. as a secretary, she met Raus Gibb. They were married in April 1936 and moved to Galesburg, IL. born in 1949. Another business opportunity opened up with a Ford dealership in Aledo, Illinois, which they took advantage of and moved there in 1952. Business was not as good as they hoped, and in early 1957 Raus and Mildred purchased the Oldsmobile and International Harvester Equipment dealership in Rushville and moved the family. Raus was diagnosed with a cancer in June 1957, and was mostly bed ridden until his death in October 1958. Shortly after Raus’s death, General Motors contacted Mildred that they were cancelling the Oldsmobile contract as they would not allow a woman to individually own and run a dealership. Even with an attorney’s help, there was no winning with them. So, she took on a dealership with American Motors and was also able to change the ownership to her name with International Harvester. Along came another person in the automobile business, Calvin Hunter, who convinced Mildred that they should merge business and their lives. They were married in 1960. They soon sold the International Harvester business, took on Chrysler autos, and cancelled the contract with American Motors. They ran this dealership until 1987. Cal wasn’t ready to completely retire so he had a small office and lot with a few cars for several years. Mildred had been in the business for nearly 40 years and was very happy to take on retirement. Mildred was active in the First Presbyterian Church in Rushville, and served on many boards and committees with other local organizations. She was also one of the founding members of the Phoenix Opera House, watching over the finances as the organization was a growing venture. Mildred was proceeded in death by her parents, six brothers Harry, Robert, Russell, Howard, Richard and Glen Eyler and three sisters Marguerite Smalley, Dorothy Arthur, and Elizabeth Schroeder her daughter Mary in 1993 and both husbands. She is survived by two children, Jane and her husband Stephen of Sleepy Hollow, Illinois, and Paul of Palm Springs, California, and numerous nieces, nephews and their children. Funeral services will be held at 9:00 AM, Friday, February 1, 2019, at the First Presbyterian Church, 301 W. Washington St, Rushville, with her nephew David Eyler officiating. Interment will follow in the Warren County Memorial Park in Monmouth. Visitation will be from 4:00PM to 7:00 PM, Thursday, January 31, 2019, at the Wood Funeral Home in Rushville. Memorials are suggested to the First Presbyterian Church or the Phoenix Opera House, both in Rushville. You are invited to share your memories of Mildred and leave condolences at www.woodfh.net.